Car manufacturers can get caught speeding too. Remember in Top Gear when Jeremy Clarkson and James May were tasked to create an advertisement for the Volkswagen Scirocco TDI, and all they could come up with was a video promoting its performance, much to the dismay of Volkswagen’s executives? Well, BMW has come under fire for deploying similar tactics in an advert published in the UK newspaper The Telegraph, and has been warned by the UK’s Advertising Standards Authority that it shouldn’t put so much emphasis on the speed of the M760Li xDrive in its adverts. A reader of the newspaper complained about the advert’s focus on the luxury sedan's speed, which highlighted its 0-62 mph time of 3.7 seconds and 610 horsepower. They also complained that the strapline of the advert, 'luxury just lost its manners,' “condoned or encouraged irresponsible driving.” Yes, it only took one complaint for the ASA to take swift action. BMW has effectively been banned from using the advert ever again, and was warned to “ensure they did not make speed or acceleration the main message of their future marketing communications.” Both BMW and The Telegraph defended the accusations, arguing that 62 mph was within the national speed limit on UK motorways. They also downplayed the “luxury just lost its manners” strapline as “advertising puffery” that couldn't be directly linked to dangerous driving. However, the ASA insisted that listing the stats highlights the performance of the M760Li xDrive, adding that another line saying “for some, the climb to the top is quicker” further emphasizes the speed. BMW said this reflected their audience climbing to the top of their careers, but the advert was banned regardless. 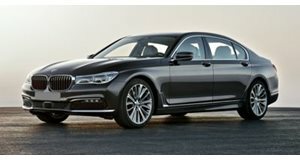 Considering the M760Li is the fastest accelerating BMW to date, even outpacing the i8’s 0-62 mph time by 0.7 seconds, you can’t blame BMW for wanting to flaunt that fact – knowing that it’s faster than some Ferraris is a crucial selling point for buyers.